The Earth Sciences & Map Library contains predominantly 20th century maps. Pre-1900 original maps and manuscript maps are generally found in The Bancroft Library's map collection; however, the collection does contain a significant number of facsimile maps for various areas of the world. Facsimiles are usually issued as exact copies of old maps, retaining the original scale and colors. These maps most often are issued as flat map sheets and will be found in the collection, with other maps of the same geographic area. The Earth Sciences & Map Library's collection also contains many works on the history of cartography. These books and atlases are usually fully illustrated with samples of early maps. Antique maps are useful for studying the evolution of mapmaking and the development of geographical knowledge over time. Old maps are also of interest for their artistic qualities: many are highly decorative, with elaborate borders, ornate cartouches, animals, people, imaginative sea-monsters, mythical beings, ships, and sea battles. Click on any of the above images to see more ships, dragons, and fishes. Rancho maps provide some of the earliest mapping within California. Most land grant (rancho) maps were hand drawn, often rather crudely. The U.S. District Court (San Francisco) placed all land grant maps used in the Court's Land Case decisions on permanent deposit in The Bancroft Library. This collection has been digitized and is available online through the Online Archive of California's Guide to the maps of private land grant cases of California. The Earth Sciences & Map Library's collection contains many reproductions of these manuscript maps, as well as other rancho maps not involved in the land case court decisions. For more information on rancho maps and their history, see the document Ranchos of California. 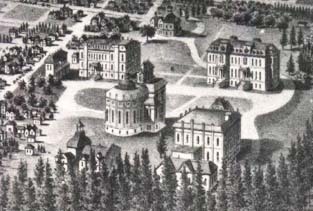 Bird's-eye views were popular during the 19th Century, especially for city areas. The second view below is a portion of Berkeley, California, looking over the campus westward, towards San Francisco. It was produced in 1891 by Irwin & Johnson, Real Estate Agents, as part of a real estate promotional. There are many other bird's-eye views in the collection, for various places around the world. Some are full-color originals, others are facsimiles or black-and-white reproductions. In addition to facsimile maps, the collection has many black-and-white reproductions of old maps. These reproductions can be on microfiche or microfilm, or in the collection as oversize photostats. Copyright © 2009 The Regents of the University of California. All rights reserved.